Collective Design Fair, held earlier this month, doesn't always get the attention it deserves. I am here to change that. Collective pushes the boundaries of art and design like no other fair. 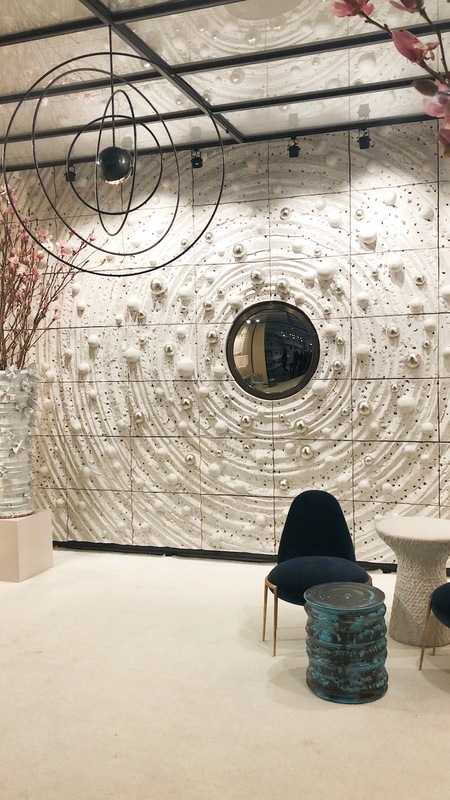 In contrast to other design exhibitions that share its focus on 20th and 21st century design, Collective Design Fair emphasizes immersive design installations. It's that total design experience, found only at Collective, that sets the fair apart. Here are some of the installations you should not miss. Harry Nuriev installation "My Reality"
Crosby Studios sponsored a bold sculpture by Harry Nuriev, entitled "My Reality." Nuriev created a grown-up version of a carousel inspired by the playgrounds of his youth. The 4 chairs spin around the wheel-table, increasing in speed with each added sitter. Everything is awash in ultraviolet to enhance the carnival feel. 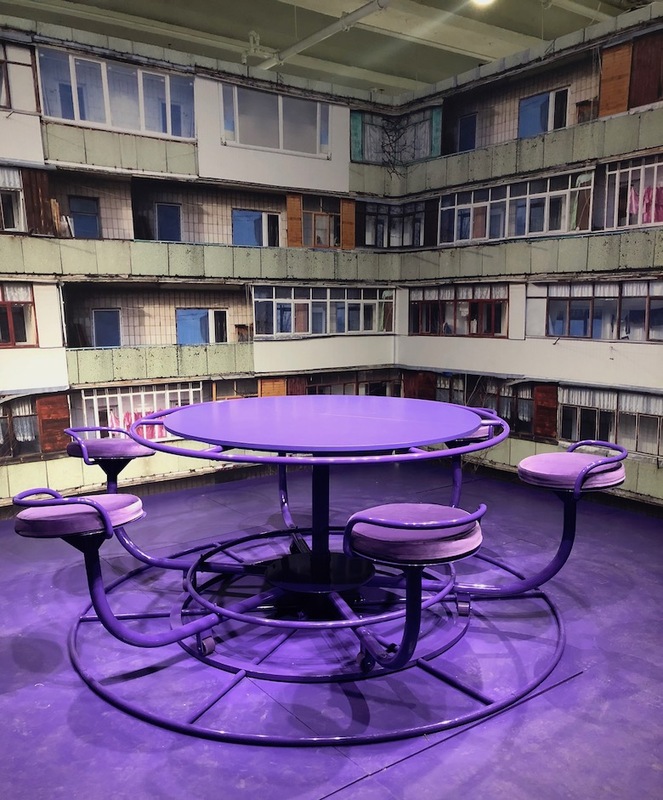 In contrast to the seating, Nuriev installed a wallpaper backdrop (created by Wallpaper Projects) that recreates the Soviet-style Brutalist architecture of his actual childhood neighborhood. The juxtaposition of the stark apartment buildings and balconies and playful carousel symbolize the lines between responsibility, play, youth and adulthood. Peter Lane's latest sculpture, created in 2018, is monumental and virtually impossible to miss. It's wall-sized. The glazed ceramic stoneware piece has platinum leaf details and a convex lens. A wow. Fernando Mastrangelo created an installation inspired by Henri Rousseau's lush paintings. Its focus was a central sunken seating area, surrounded by planters, in front of sand-cast background. Ok, it's nice. However, I really loved the diorama shown above that was tucked into a side wall. Here is where Rousseau's influence is most felt. One look will make you want to climb inside. Jamie Bush, known for his mash up of architecture, art and design, created an installation honoring the humble chair. He produced what he calls a "sculptural pile" of generic chairs and surrounded it with large scale photographs of similar piles. Chairs, deemed "important" are displayed on pedestals. It won Galerie Magazine's award for best installation. Do you agree? Yes, the venue for Collective Design Fair was itself an immersive design experience. For the first time, the second floor of Skylight Clarkson North, an industrial space obscurely located in the far West Village was the location for Collective. To get to the fair, you rose in a large commercial elevator that quivered as it moved and opened vertically. The ride created suspense and anticipation. But the real beauty appeared when you meandered into the central space. Here you were confronted with an incredible luminosity generated by the surrounding three exposures. 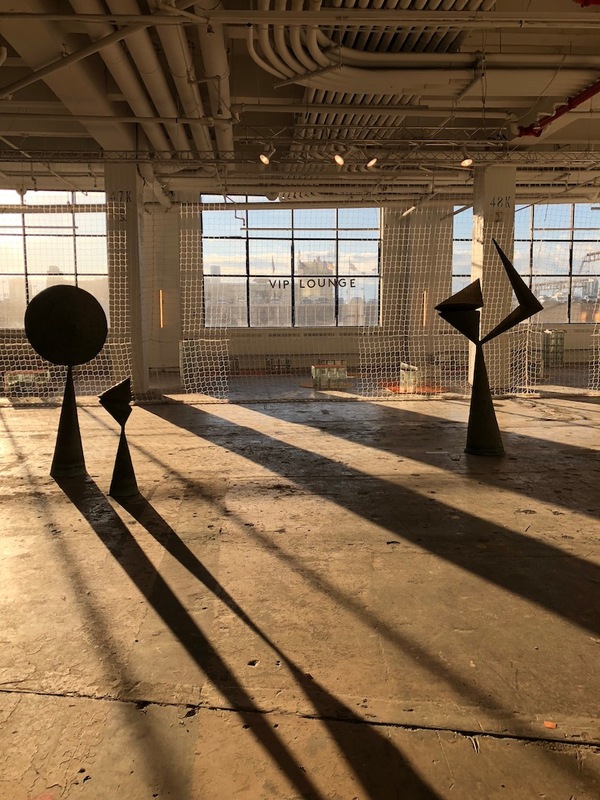 Look at the gorgeous shadows cast on these Harry Bertoia sculptures shown above. Additionally, Justin Morin's installation of translucent curtains in a rainbow of shades would have lost its impact without the light streaming through from multiple sides. Click on the link to video I took while there to truly appreciate Morin's piece. After moving around to various locations in its 6 year history, I hope Collective has found it's permanent roost and focus. Except for Jaime Bush's installation photo via Galerie Magazine and the image of Justin Morin's installation from his website, all other photos by Lynn Byrne.